Live Hope Minute, from Nashville-based author, musician, and actor, Mark Smeby, is a daily moment of hope and inspiration, focused on helping radio listeners uncover the reality of hope - what it means, and where it can be seen in their lives, in culture, and in their faith -- and then find ways to live out that hope to the world around them. Listeners are invited to share their views on hope via www.livehopenow.com. This inspirational feature explores the concept of hope with Mark Smeby's engaging approach, delivered from a grace-filled, Christian perspective, certain to be accessible to people at varied places on their spiritual journey. 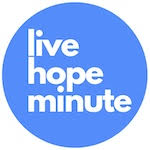 Live Hope Minute is currently heard on 250 radio outlets in the US and Canada. For further information and demo, or to start airing LIVE HOPE MINUTE today, please contact Bev at Media Solutions. 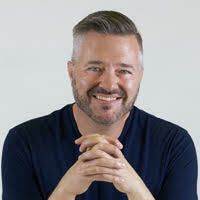 Mark Smeby is a Nashville-based author/speaker who is all about hope-creating products, resources, and live events all focused around the topic of hope. He travels the country sharing the message of hope through his music and speaking engagements-in a variety of locations from churches, corporations, schools, and prisons. He has released numerous songs to Christian radio, including his latest, "You'll Get Through This." His version of "Mary, Did You Know" is one of the most downloaded Christmas songs on Amazon for two years. He has co-starred in an episode of ABC's hit series, "Nashville," in addition to a lead role in the faith-based film "Gracia," and previous films, "1 Message," "The Perfect Gift," and "The Hepburn Girls." His first book, "The Messenger" (a fable of hope) was published by Broadstreet Publishing in 2016. More about Mark is available at www.marksmeby.com or twitter: @msmeby. "Mark Smeby's Live Hope Minute is one of the most effective ways to speak hope into people's lives. We're always looking for ways to connect with our listeners, and this is it. This short feature ministers to me each time I hear it, and I can't wait until other stations discover it." "The Live Hope Minute with Mark Smeby has been a refreshing addition to our morning drive time! Seriously, one of the best one-minute features we can share with listeners that can and does make a difference! This minute breathes the living hope we have in Christ to a world that offers no hope." When you are prompted to download the Live Hope programs, click save. After the files have downloaded to your computer, you will need to Un-Zip the folder to view the MP3 files. You can usually do this by right clicking on the zip folder and selecting "Extract All."